Electro-Harmonix, the NYC based pedal company, is known both for its highly functional pedals, as well as its experimental offerings. The Pitch Fork sits somewhere in the middle of these two categories, as it delivers a broad range of pitch shifting possibilities. 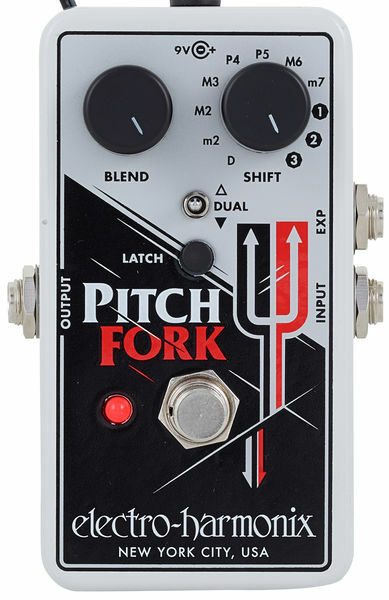 Somewhat typical of EHX’s offerings, the Pitch Fork’s interface is efficient and intuitive. 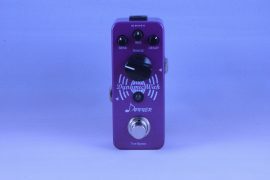 The pedal features two knobs, two buttons, and one mini switch. 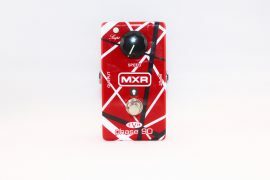 The Blend knob allows you to adjust the amount of dry signal that is fed through the pedal’s output. Turn the knob down and all you get is dry signal, turn the knob up, and all you get is wet signal. This feature is extremely useful when it comes to fine tuning harmony effects. The other knob is labeled Shift, and controls the amount of pitch transposition that the wet signal undergoes. The transposition settings are as follows: D, m2, M3, P4, P5, M6, m7, 1, 2, 3. Spelled out in standard terms, these stand for: down-tune, minor second, major third, perfect fourth, perfect fifth, major sixth, minor seventh, one octave, two octaves, three octaves, respectively. The mini switch allows you to toggle between three modes: down, dual, and up, meaning that you can harmonize in either direction, depending on your needs. In each of these modes, the blend knob is particularly useful, though in different ways. For the down and up modes, the blend knob controls the ratio of original pitch to transposed pitch. Perhaps you want to use the Pitch Fork to change your guitar’s tuning in a pinch; in this case you could turn the blend knob all the way up and set the shift knob to the desired interval of transposition. Or, maybe you want the harmony effect, but you do not want the two voices to sound at equal volumes…in some cases you might want the harmony to be more of a subtle gesture. In this case, tweak the blend knob to your liking and you’re off to the races! Dual mode adds a little bit of EHX’s special sauce to the mix by allowing three harmonies to come through the pedal. When engaged, this mode responds to changes of the shift knob as if the pedal were in up mode, but in addition to this the pedal adds a complimentary harmony, based on the interval. The wet/dry ratio is still controlled by the blend knob, but on this setting, EHX throws in some extra juju for a brilliant harmonic effect. In this way, the dual mode is kind of like a bonus mode; you can always go for a precise setting using the up or down modes, but when you are feeling like letting go of some control and letting the pedal do its thing, the dual mode can be really quite satisfying. As always, tweaking goes a long way. The Latch switch controls the behavior of the footswitch. When the latching function is engaged, the pedal behaves as you would expect: click the pedal on and the effect kicks in, click the pedal off and the effect goes away. 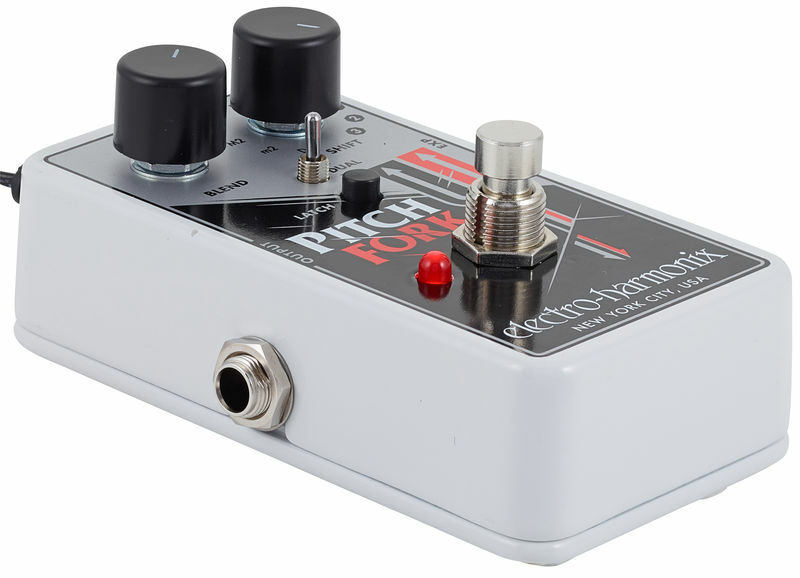 When the latching function is turned off, the footswitch behaves more like an expression pedal, meaning that the pitch shifting effect is only engaged for as long as your foot holds down the footswitch. In this mode pressing down on the switch also generates a glissando (slide) as the pitch shifting effect is engaged. The idea here is that in this mode, the pedal functions much like a traditional whammy pedal. 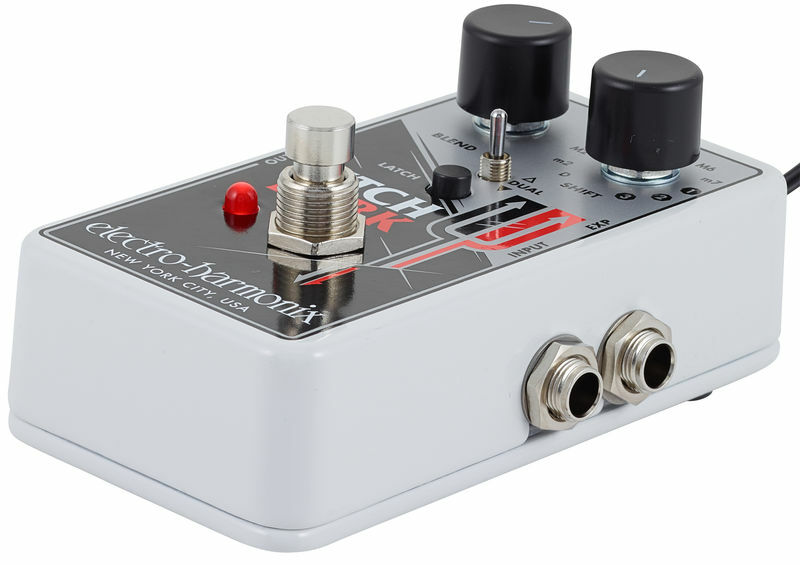 To maximize the whammy effect, EHX has included a second input jack, labeled EXP, which allows you to connect an expression pedal to further maximize the whammy potential. Glissando rate can vary between 4 milliseconds to 2 seconds, depending on the position of the expression pedal, and when no expression pedal is plugged in, the glissando rate sits at a comfortable, yet still expressive 60 milliseconds. 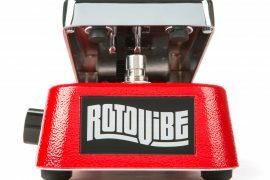 One of the most common concerns when it comes to pitch altering effects, is the pedal’s ability to accurately track the performer’s playing. Harmonizer pedals in particular seem infamous for their shortcomings in this area. However, the Pitch Fork does a surprisingly good job of tracking, such that it sounds almost flawless in live contexts, and could even be used in some recording contexts. The other issue with these types of pedals involves the sound quality of the altered pitch sounds. Typically (looking at you DigiTech Whammy), the generated harmonies sound a bit digital or synth-y. With the Pitch Fork, this is only an issue at the highest two octave settings, leaving the rest sounding quite realistic. 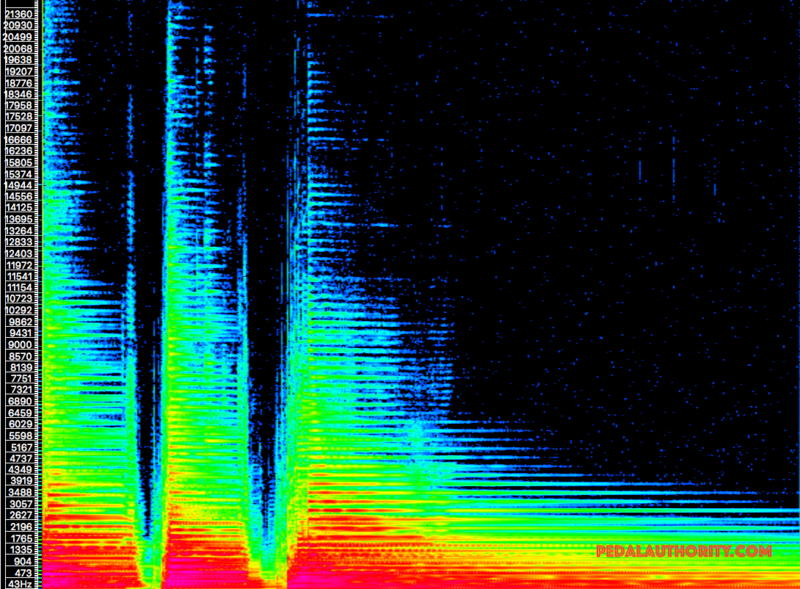 Some loss of frequencies, but no serious gouging. 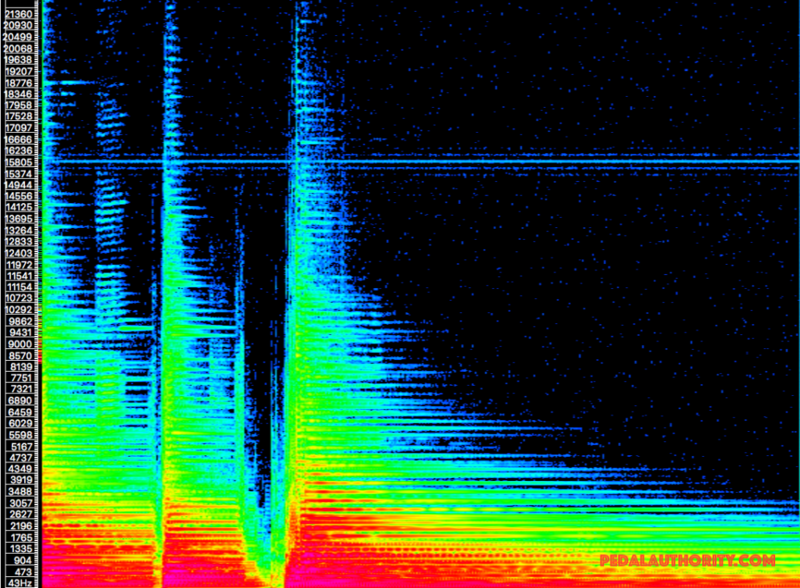 However, take a look at the artifact at ~16kHz. This is something well within the boundaries of human hearing, and something you may in fact hear, depending on your rig. 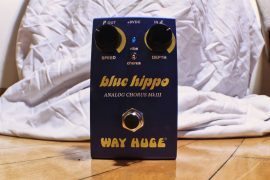 It is a slight hum in the upper frequency range, and though not completely distracting, it does draw a little bit of attention to the fact that you have some type of pitch modulation pedal in your signal chain. Now, if your amp has an effects loop and you are running your modulation effects through that effects loop, this could be less of a problem, as many amps have foot-switchable effects loops. 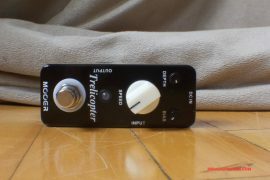 In this case, you could bypass the effects loop when you are not using this pedal to get rid of the humming. 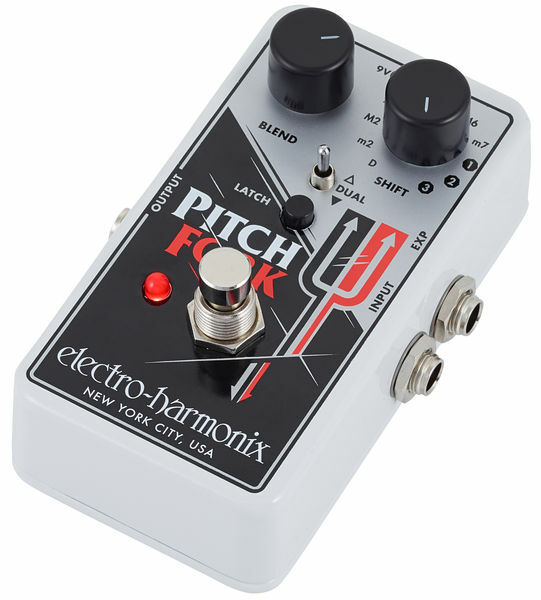 Considering the price, and the small footprint, the EHX Pitch Fork is a remarkable product. With an easy to navigate interface, realistic sounds, and functional settings, this pedal should definitely make your shortlist if you are searching for a harmonizer, whammy pedal, or just a plain old pitch shifter.